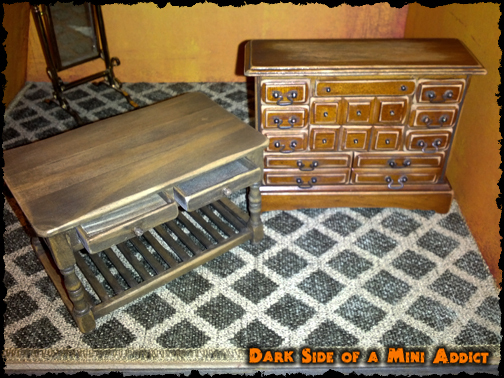 This weekend I pulled out some furniture I had and went to town on dulling and darkening it. Originally you can see the bedroom furniture was very red and shiny but I want it to look old. So after I pulled the fabric off and the mattress I sanded pretty much the whole thing down and then gave it a wash of dark layers. 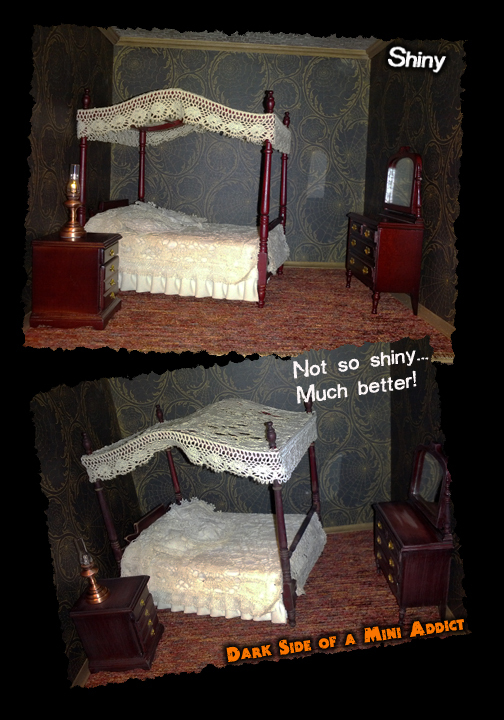 I also did the same with the night stand and dresser. The fabric I think I may darken with a tea soaking since it looks old already. I’ll try to take a closer picture to show you. The lamp is one of those LED ones that you can swap out the battery (watch battery). I bought the one you see, a Tiffany lamp and a few ceiling ones that I thought would work well in the house and could be changed out since this house is not electrified. The table in the other photo will go into the kitchen and the other cabinet either the sitting room or one of the rooms on the 3rd floor. That’s it for now, I have to go find a few kits I have evidently safely tucked away somewhere in case gnomes invaded and decided they needed them more than I. Thanks for following my blog and hello to my new followers.